The hills roll in from the west, and make gentle folds in the countryside between Stowmarket and Hadleigh. Some of the valleys are quite dramatic, and in one of the steepest sits the village of Rattlesden. Rattlesden is a large village in a wide parish, and in fact the parish contains several other settlements; one of them, Hightown Green, is bigger than many other Suffolk villages. 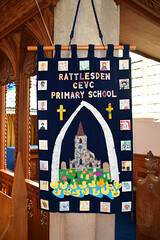 But it is Rattlesden itself that contains the parish church, and what a dramatic setting! Half-timbered houses clamber the slopes either side of the splendidly named River Rat. On the south side they are particularly grand, and include a fine old pub. There is another pub on the north side. 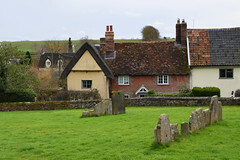 The churchyard drops dramatically away to the south-east. A steep path descends from the road above the graveyard giving a grand view of the building, and it doesn't take much to see that St Nicholas is a little unusual. 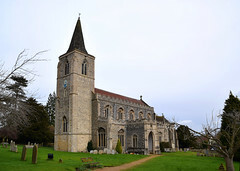 Although the assemblage of nave, clerestory, aisles and chancel are familiar 15th century rebuildings in this prosperous area, the tower is a little out of the ordinary. Uncastellated, but with a little wooden spire, it was remodelled by Sir Arthur Blomfield in the later years of the 19th century. Replacing an earlier spire which had fallen, but avoiding Richard Phipson's psychedelic fantasies at nearby Woolpit and Great Finborough, he produced something much more austere, although in its way just as singular. The shortness of the spire create an effect a bit like a hat on the thin tower. Two clasping pencil-like buttresses rise on the west side, and the tower appears to lean into them, but this is perhaps just an optical illusion.The exterior took its present form in four stages. 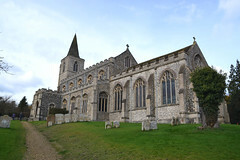 Firstly, the original nave was built in the 13th century, probably replacing a Saxon or Norman building. A hundred years later, the tower was added. 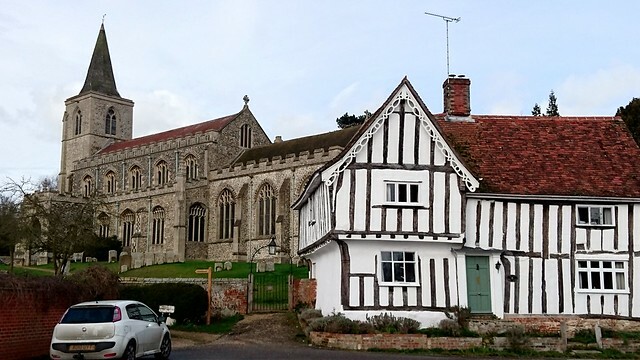 Next, the dramatic remodelling occured in the 15th century, when the little church was transformed by the addition of Perpendicular aisles and a clerestory. The clerestory is a beautiful one, and above its windows, between the battlements, is a sequence of holy symbols. 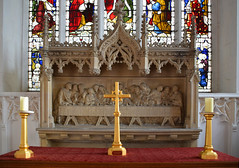 They are for the Blessed Virgin and most of the disciples, but also include St Edmund of East Anglia and St Etheldreda of Ely, a reminder that the Priory there was one of the patrons of the living here. The pinnacles finish it all off a treat. You step in through the south porch into a wide, urban interior. 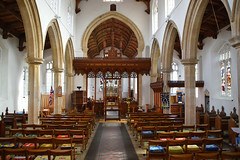 Apart from some medieval benches in the south aisle, the pews were all replaced with modern chairs, which always looks good and is always a blessing to anyone who actually has to sit on the things. 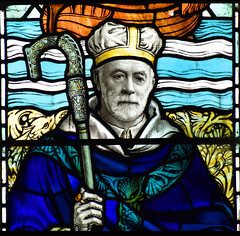 St Nicholas has an excellent range of 20th Century glass by William Aikman, four windows installed over a period of almost twenty years. 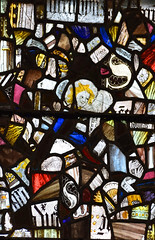 The earliest is the war memorial window in the south aisle depicting St George flanked by scenes of the angel staying Abraham's hand as he attempts to sacrifice his son Isaac, and David about to face up to Goliath and dispatch him. Next came the best of the sequence, to the children of the parish in 1927. 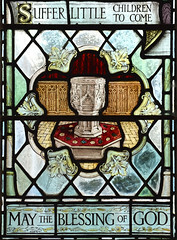 Although the central figure of Christ is unremarkable, he is flanked by children of the world in different national dress, and beneath are images of the Rattlesden font and reredos, still easily recognisable today. 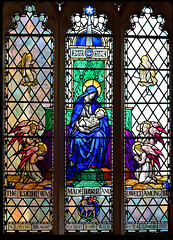 Above in the upper lights are the figures of six significant Biblical teenagers, Mary at the Annunciation, Joseph in Egypt, David the Shepherd, the young St John the Baptist, Jairus's daughter and Huldah the Prophetess who appears in the first Book of Chronicles. 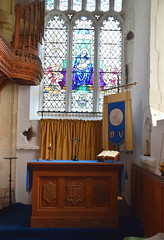 The 1930s brought two further windows, an Adoration of the Angels at the east end of the south aisle, and up in the chancel a most curious memorial to a rector of Rattlesden, Joseph Russell Olerenshaw. It depicts him photographically as St Nicholas. On the left, Thomas Rattlesden greets Henry VII outside the gates of Bury Abbey, whilst on the right St Edmund of East Anglia is martyred. 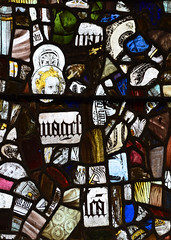 There are collections of fragments of medieval glass in the north aisle and west window beneath the tower. But what makes St Nicholas remarkable is that it has one of the most complete and precise reconstructions of a rood screen system in England. 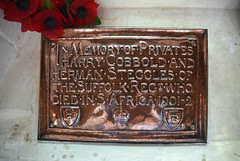 It was constructed between 1909 and 1916 to the designs of George Fellowes Prynne. 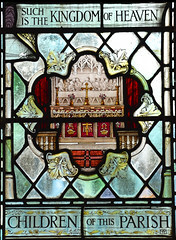 It is based on a medieval fragment surviving at the west end. One of the reasons it is so impressive is that it does not try to recreate a medieval effect, but rather serves to demonstrate the actual mechanics of how the whole thing worked. If you are lucky enough to be allowed through the locked grill, the original roodloft stair in the south aisle takes you up into the loft of the parclose screen as at Dennington, and then up a ladder and through an opening in the south arcade across into the roodloft itself. This crosses to the north arcade, beneath the elegant arch. 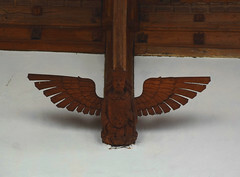 The rood is a grand thing; however, I suspect that the original rood here may have been even bigger, hence the backlighting from the triple lancet window in the east wall of the nave. 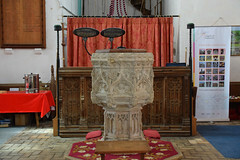 The other little opening may have been designed to enclose a sanctus bell, which would have been rung from the rood loft. The doors in the rood screen are very heavy, effectively separating the chancel from the nave, and the chancel itself is fitted as a choir, which must have been the very thing at the turn of the 20th century. 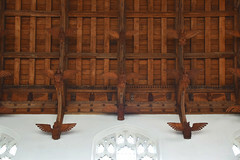 Above all this, this vision of the medieval is completed by the angel roof installed in the 1880s. Imagine all this wood ablaze with colour, and you'll begin to get a feel for what this place must have been like when it was first in its current form towards the end of the 15th century. The chancel is grand without being overstated. The east window depicts an unremarkable Ascension by Clayton & Bell of the 1880s. Looking back towards the nave and the tower arch, you'll see that it is, unusually, raised up a step, as if to improve the view. The railings dividing it off are actually the former communion rails removed from nearby Kettlebaston at the time of its Anglo-catholic makeover. Within the tower arch a quaint wrought iron staircase spirals into the belfry. Back in the nave are several reminders of the connections between this parish and the United States. 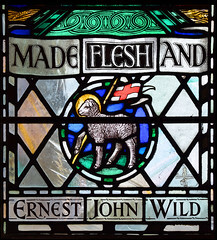 The Kimball family came from here, and their ancestors have installed a plaque in the north aisle as well as paying for the bringing together of fragments of medieval glass in a north aisle window. 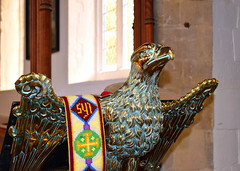 The north aisle chapel remembers the presence of the USAAF on Rattlesden airfield during WWII. The 'K' on the prayer desk recalls not only the Kimballs, but also that it was the operation letter for planes flying from the base.